More than anything my parents did or did not give me growing up, I’m thankful for the way they taught me to manage my money. We had allowance (for doing chores), a savings account (that they would match up to a certain amount when we made a contribution), and a clothing allowance beginning in high school (when I learned that name brand clothing-at full price-was overrated!) I think having that modeled to me as a child has made living that way as an adult so natural. When I became a nurse, I started to realize that knowledge about using money wisely was one of the major things that set my finances apart from some of the low-income families I helped at work. We didn’t have much money either. But in this case, certainly, knowledge IS power. I would also add self-discipline and contentedness to that list. Jonathan and I married young. He was 21 and I, 22. We were still in college and barely made ends meet the first year (Heck, we’re still on a tight budget now!) Through scholarship, jobs, and parents/grandparents who generously gave gifts, I was able to whittle away at tuition and living expenses and graduate college completely debt free. Communication helps to build good habits. I realize a lot of people don’t like to talk about money. It’s touchy. It’s private. But when you know you’re accountable to someone you love (your spouse, for example), it makes you think twice at the register. From my experience, getting married is a great time to start a budget. From the beginning. Before you develop other habits. That way you can both be involved in practicing new ways to manage your money. Some of you may think this is overboard, but Jonathan and I entered every receipt into a budget spreadsheet for the first 2 years we were married. I’ll admit it is a real time commitment, but, for us, it was extremely helpful in setting our habits early in our marriage. And after 2 years, we really didn’t need to do it anymore. We had a really good handle on where our money went and what our spending tendencies were. Now, we can use something like mint.com with a lot of confidence. Pay attention. This really is one of the biggest things to me. I’m amazed how many people say things like “I know I’m spending a lot, but I’ve got to eat, right?” Or they have no idea what something they always buy costs (milk, for example). When it comes to groceries, I’m not a coupon-er. For me, it’s too much time spent on things I don’t usually want. I do like free coupons (ones that come in the mail or print out with my receipts). But, the most important thing to me is realizing what I normally pay or what I could typically get it for when it goes on sale. Oatmeal may be on my list, but maybe it could wait another week if the price is up (some things can’t wait, of course). Also, I’ve found that certain stores sell a few things I get really regularly (like frozen fruit or string cheese) for half the price of my usual grocery store. I’m not talking about spending all day going all around town. But a few strategic things that are really discounted really add up in savings. Having “spending money”, no matter how tight the budget. Spending money is what we call it. The point is, set aside a little (in our case it’s really a little) money that you can spend on whatever you want without being questioned. If I want to spend it all on gum and coffee that month, that’s my prerogative. If I want to save it up for something I’ve had my eye on, I can. I think it helps to alleviate the need for impulse buys. Make up your mind. Whatever your financial goals are, make up your mind that that’s how it’s gonna be. If you don’t want to take out a loan to refinish your bathroom, don’t. If you don’t want to spend $500 on groceries a month, figure out how to do it another way. Deciding ahead of time is huge in helping you to meet your goals. I’m no expert. I’m certainly not a financial guru. I do believe in putting myself around people who are wise with money if I want to be wise with money. These are just my humble opinions from my experience. Okay. So…we, somewhat unintentionally, made another upgrade to our den! 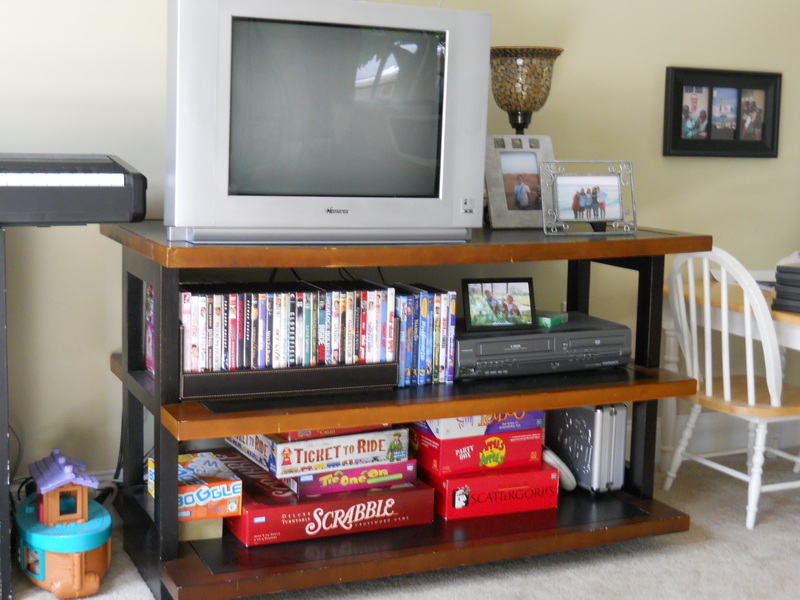 Say hello to our new and improved entertainment center. That is, we knew what we were doing when we bought it. I guess I say unintentionally because I kept thinking that buying unnecessary furniture like that was still far out in our future. Right now, we have to make our pennies count, so upgrading perfectly functional furniture isn’t at the top of the list. But, then I found this for $60 on craigslist! That’s right, I got a real steal in this one. This is even better quality than the pictures portray. 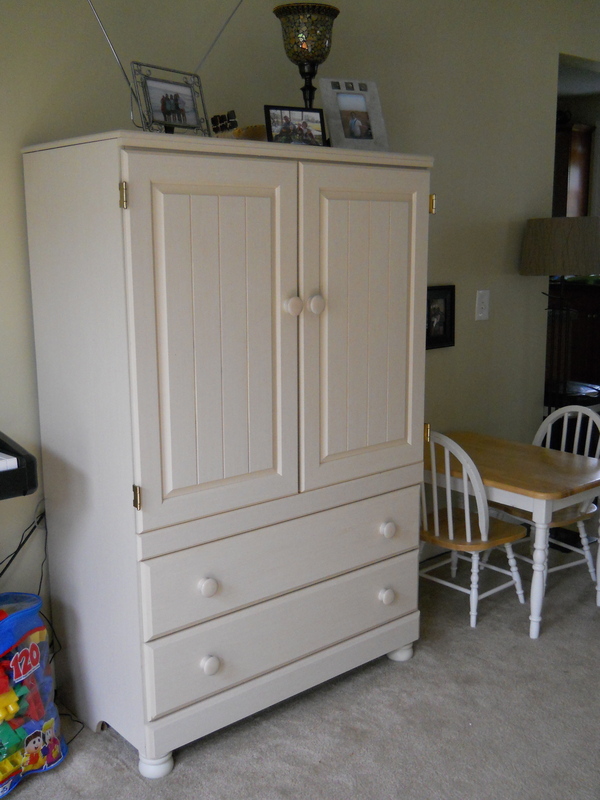 Just to give you an idea, most quality armoires sell for $175-$400 on craigslist. Much improved, wouldn’t you say? Yeah…me too! Now, we can hide all of our junk (from Liam…and guests)! The previous one (along with the matching side table) is currently listed on craigslist. 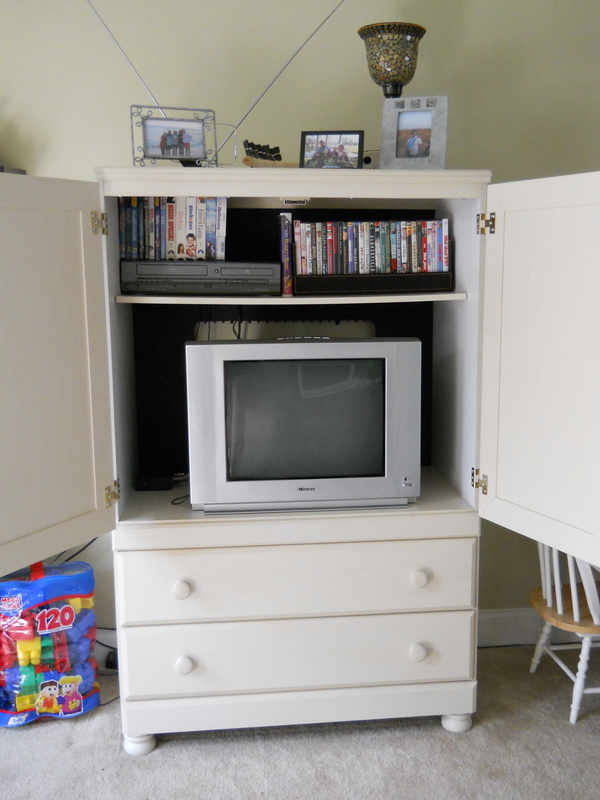 If all goes according to my hopes, we’ll only be around $20 in the hole for a quality, like new entertainment center! Some of you reading this may never want to buy something used. To that, I say thank you for buying (and then selling) things that I can buy from you when you’re done! However, those of you reading this and thinking that I’m so lucky to “fall” into great deals all the time, I thought I would share a few pointers that I’m figuring out as I go. There is a cost to being frugal, you know. It’s well worth it to me, though! 1. Look often. The places I most commonly find good deals include: craigslist (practically all of the major furniture in my house), yard sales (nice, newer neighborhoods are where I really tend to find the good stuff), and the Habitat ReStore (more for supplies/hardware/etc. than furniture). With all of these, namely the last two, it’s important to keep an open mind. You may not always know what you need until you find it. This does not mean I’m in favor of collecting a bunch of unnecessary junk. 2. Be Picky but realistic. If you have something specific in mind, don’t rush to buy the first thing that “fits the bill”. If you check these places often enough, you’ll learn what good prices are and how frequently they’re available. In general, I suffer from buyer’s remorse and, therefore, tend to not buy rather than buy. Over time, though, I think I’ve become more confident about when I’m coming across a true bargain. 3. Research before you “do”. I’m learning this one the hard way. I want to conceive an idea and BAM! be done with it. One of the problems with the internet being so accessible is that anyone can write about anything. Some things look nice in pictures, but lack quality to make it last. I feel frustrated when I’m stunted in my DIY project. I want it to be over about…2.5 minutes after I start it, but, in the end it’s much less of a headache if I do it right the first time. 4. Suffer the inconveniences. There are going to be plenty if you choose to do things on a budget (I mean a real budget). You may need to live with the “old” or the “transient” for months (or longer) before the perfect “new” comes along. Learning to fix, repurpose, or even just pick up the thing can be time consuming! For example, the night we went out to look at and purchase this piece, we almost turned around a couple of times. First of all, Jonathan graciously gave up his rare “night off” to join me in trek-ing across town. Then, we had to arrange borrowing a truck (thanks, Buckle!) since our little Volvo just doesn’t have the capacity (even more so with Liam in the back seat). Then, we hit terrible, stand still traffic. Then, we made a few wrong turns (out in the boondocks). And, of course, Liam missed his bedtime by, oh, an hour or two. 😦 It’s been a process for me to realize that one night of frustration is sometimes worth the joy/convenience of whatever it is we’re getting. These are, of course, only tips about frugality as it pertains to home improvement. Maybe I’ll post some on other topics another time.